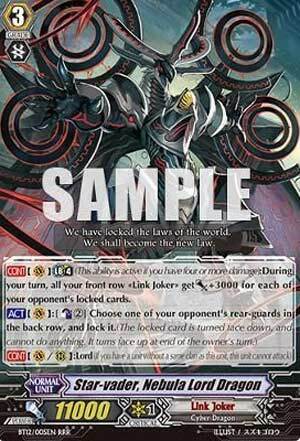 [CONT](VC) Limit Break 4 (This ability is active if you have four or more damage):During your turn, all of your front row «Link Joker» get [Power]+3000 for each of your opponent's locked cards. ...Nebula Lord Dragon is one of those cards where it's going to be a nice threat for the next few months until we are introduced to something even scarier than himself, but for the time being, let's take a look at this guy. He has 11,000 power, which is always a plus, and a Limit Break that strengthens your field for restraining your opponent's field. The Limit Break gives not just Nebula Lord, but your entire frontline an extra 3,000 power for each card your opponent has Locked on their field. The best case scenario, as rare as it is, is somehow getting your opponent's entire field Locked and giving your frontline an extra 15,000 power though as hard as it may be to do, combining this with Infinite-Zero Dragon, Dust-tail Unicorn, Nebula Lord's own effect to Lock a back row and a few other Link Joker cards, if you aren't Locking their entire field, it'll be really close to a full Lock and can at least give out an average 6,000-9,000 power boost to your frontline. The invasion continues for Space Week, and today we have the ace for Link Joker decks (until May comes and ruins EVERYTHING), Nebula Lord Dragon. He grants 3000 power to every front-row unit for each locked card the opponent has with his Limit Break, and from Mid Game onward, he can lock a back-row unit at the cost of Counterblast 2. Well, the skill's efficient enough, I suppose. For a cost of CB2, you essentially make one column swing for 5k guard at best. Possibly reducing that unit's ability to hit your Vanguard to nothing at all if that column was compensating with a strong booster, which is now paralyzed. However, Nebula Lord does badly need external help in order to go anywhere. To use his skill in the most efficient manner, you pretty much have to have all your column set up swinging for a total power of 18k, so that the 3k bonus makes them 21k, the sweet spot for non-crossrides to make them guard more. This should I suppose still happen given that you have to scale for Crossrides anyway regardless, but it does just leave you with a largely Vanilla deck until Late Game, which is a weakness to Link Joker in general; they just don't have the support to actually spam Lock turn after turn. So any other deck with better finishers now have time to set up and murder you. I wouldn't worry too much about him; Lock is generally nowhere close in terms of long-term benefits as retiring a unit. As long as the deck's propelled to Late Game quickly, he's manageable. Yesterday we reviewed a Яeversed card but today we’ll review a creature from Link Joker directly. Nebula Lord Dragon is your standard limit break 4 gain power and we’ve seen it before. But this is different. He gains power from locked units your opponent controls. That being said at a cost of 2 counterblasted cards he locks an opponent’s card. I’m actually surprised he’s not more deadly to be honest. Storyline wise this guy is the one responsible for the invading forces of the Dragon Empire and Dark Zone so, If you use a Яeverse card from either clan, he was responsible. So is he worth all the hype? As far as Link Joker goes this guy isn’t as scary as some of the more horrifying creations of void. 2.8/5 That being said, there will be someone who loves this card.